Outlook Attachment Extractor is a flexible solution to extract attachments from emails received with Outlook automatically. The program allows you to use properties of emails for dynamic naming of the storage folder or file name of the attachment to be extracted. For example, you can integrate the receipt year or the email sender name into the folder name. By using the filter, emails to be processed can be strictly limited. All settings made, for example, the Outlook folders to be monitored or the filter criteria are stored in individual profiles. The help describes the features of the program and gives instructions for using Outlook Attachment Extractor. Use this menu item to open the dialog window for customizing the program options. In case of technical problems, you can create a bug report by using this menu item. The created file is named "Outlook Attachment Extractor - error report" and located on the Desktop. You can then send us the error report attached to an email with a short description of the problem. This menu entry can be used to restore previously saved application data. Clicking this button opens the dialog window for creating a new profile. This button opens the window for editing the settings of the currently selected profile in the list. Alternatively, double-click the profile you want to edit. Newly created profiles are given the status "active". All profiles with this status will be applied to incoming emails. To disable a profile, click the check box at the beginning of each row. The status then changes to "inactive". Shows date and time of the last successful application of the profile. Here you determine where the extracted attachments should be stored. In the input field labeled "Directory" you specify the base folder e.g., "C:\Data\Invoices\". This path cannot contain dynamic name parts. The input field "Folder" can be left blank - but there is also the possibility to assemble the folder name from parts of the respective email properties such as the receipt year. More levels of subfolders can be formed by adding the appropriate path separator "\". The input field for the file name can also be left blank or contain placeholders for individual email properties. The preview shows the complete path to let you check the result in advance. The spaces at the beginning and end of each folder are only for better clarity and are not included in subsequent use of the profile. If a file with the specified name already exists, the chosen name collision rule will be applied. Enter here optional the expected (or a similar) file name of the attachment to be processed. This can be useful if you want to compose a new file name from parts of the original attachment file name. To change the preview file name, click on "Preview". Here you specify whether the email should be moved into the specified directory after successful processing. For automatic further processing, the path of the extracted attachment can be passed to a program as parameter. Here, you can optionally enter the path of a program that should be executed after the successful extraction of an attachment. The log list contains information about all processed emails within the period that is specified in the program options. By default, this period is 30 days. With a click on the respective column header, the sorting of the list can be adjusted. Here you can define settings such as the language of the user interface and the starting behavior. This is the recommended type of access for older version of Outlook (2007 and 2010). In case there are problems or conflicts with other Outlook add-ins, the type should be changed to "direct access", which generally works fine. 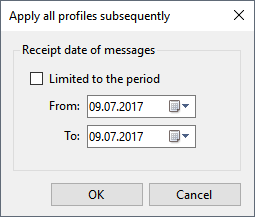 This option should be used if there are multiple Outlook profiles available to logon to. The program will create its own Outlook instance and logon to the standard profile. This option can be used if there is only one Outlook profile that the program can logon to. There are no advantages to using this option - depending on the individual system, one or the other variant may be better supported. If this option is activated, the program automatically calls the Outlook function "Send/Receive all" at the interval set below, if Outlook is not opened. Determines at what interval (in seconds) "Outlook Attachment Extractor" checks whether new messages have been received. By default, errors that occur when saving an attachment are displayed in a dialog box. The program flow is interrupted until acknowledgement is confirmed (by clicking OK). Activating this option will disable this behavior. Any errors that may have occurred are then only visible in the log. With this option, you can limit the number of messages to be processed per run. In addition, when using the Catch Up function with this option activated, a pause of the length of the defined interval is made after each processed email. Here you can specify the retention period of the log entries. The value set here determines the oldest recorded email receipt date and is relevant if emails are moved manually or subsequently into the monitored folder. Subsequently moved emails are only processed if their date of receipt is newer than the oldest email date recorded in the log. If you activate this option, the log list entries are colored alternately, depending on the current sort criterion.